Keto gluten-free crab cakes are made with almond flour instead of breadcrumbs. They are wonderfully crispy and delicious! These keto and gluten-free crab cakes are amazing. They are crispy, delicious, and filling. My entire family loves them, so I make them quite often. Simple! Scroll down to the recipe card for the details. These keto crab cakes don’t contain any breadcrumbs. Instead of the traditionally used breadcrumbs, I use almond flour. The result is just as crispy and tasty as regular crab cakes. As always when using crabmeat in recipes (such as these amazing crab stuffed mushrooms), the fresher the crabmeat you use, the better the dish will taste. Fresh crabmeat is delicate and sweet. It is also very healthy! But the supermarket lump crabmeat that comes in small plastic containers tends to be quite fishy. If you don’t want to steam your own crabs (who does?) and you have Whole Foods in your area, try the crabmeat sold at their seafood counter. It’s the best I’ve found, so far. It’s very important to chill the crab cakes for at least an hour prior to frying them, so please don’t skip that (admittedly annoying) step. They are very delicate and could easily fall apart when you fry them if they’re not chilled first. If you need a sauce for your gluten-free crab cakes, try mixing 1/4 cup avocado oil mayonnaise with 1 tablespoon Dijon mustard, 1 tablespoon sugar-free ketchup, and 1/2 teaspoon garlic powder. Or try this delicious homemade tartar sauce. What about side dishes? When I serve these keto crab cakes as a main dish rather than as an appetizer, I like to serve them with cauliflower potato salad or with tomato asparagus salad. I like the fact that I can make both salads ahead of time so that I can focus on frying the crab cakes. You can keep them in the fridge, in an airtight container, for up to 3 days. Make sure you reheat them very gently. You can use the microwave on 50% power, or reheat the keto gluten-free crab cakes in a 250F oven. They are also very good cold, straight out of the fridge! I sometimes just grab one as a snack. 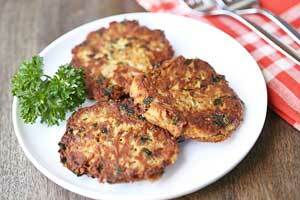 Low carb and gluten free crab cakes are made with almond flour instead of breadcrumbs. They are wonderfully crispy and delicious! In a medium bowl, use a fork to combine the crabmeat, garlic, parsley, egg, mayonnaise, mustard, kosher salt, thyme, cayenne pepper and almond flour. Form into four 1/2-inch-thick cakes, each weighing about 3oz (90 grams). Place the crab cakes on a platter lined with wax paper. Cover loosely with plastic wrap and refrigerate for at least one hour. Heat a large nonstick skillet over medium heat, about 5 minutes. Add half of the butter and brush to coat. Add the crab cakes. Cook 4-5 minutes without moving, until you can see on the edges that the bottoms are browned. Very carefully lift each crab cake with a wide spatula, add a little more butter to the skillet and lower the cake back into the skillet, to cook on the other side, 4-5 more minutes.